Gulf Shores and Orange Beach, the main communities along Alabama’s 50-odd miles of Gulf of Mexico shorefront, have what nowhere else does: a combination of that famous laid-back Southern lifestyle and Caribbean-quality beaches. But that’s just the start. From premier music festivals to world-class fishing, fresh oysters to shipwreck dives, here are 11 moments you can expect to live out on your visit. It’s shocking that more people don’t know about Alabama’s Gulf State Park, because it puts most other state parks to shame. It’s made up of 3.5 miles of beaches, many more miles of nature trails, a fishing pier, and a dog pond (yep, that’s a pond set aside specifically for your dog). There are pelicans, sea turtles, butterflies, gators, and puh-lenty of seagulls to keep you company, too. If you’re looking for a gorgeous — and not super-crowded — public beach, definitely check out the entrance to the park near the main beach pavilion. For $6 a car, you’ll get access to the beach and the pavilion’s concession stand, showers, and fire pit. It’s perfect for a day trip — or for getting in one more Gulf-filled day after your hotel checkout. There’s no place in the world like the Flora-Bama Lounge & Oyster Bar. It’s a gigantic and somewhat ramshackle dive bar — in the absolute best way possible — that opened in 1964 and almost immediately became a classic. Consider it your gateway to the local culture when you visit. The Flora-Bama straddles the Alabama-Florida state line and is made up of a restaurant, multiple bars, and live music venues, along with the package liquor store that started it all. Decorated with more discarded bras than you can count and almost always hopping on weekends, you really can’t have a bad time here (especially if you order a plate of oysters). Some consider it “the world’s best beach bar,” but you’ll have to decide for yourself. What I won’t let you decide for yourself is leaving without trying a Bushwacker: the chocolaty, coconutty, frozen rum cocktail the Flora-Bama is famous for. Every May, the beaches of Gulf Shores are transformed into a major music festival, held right on the sand. 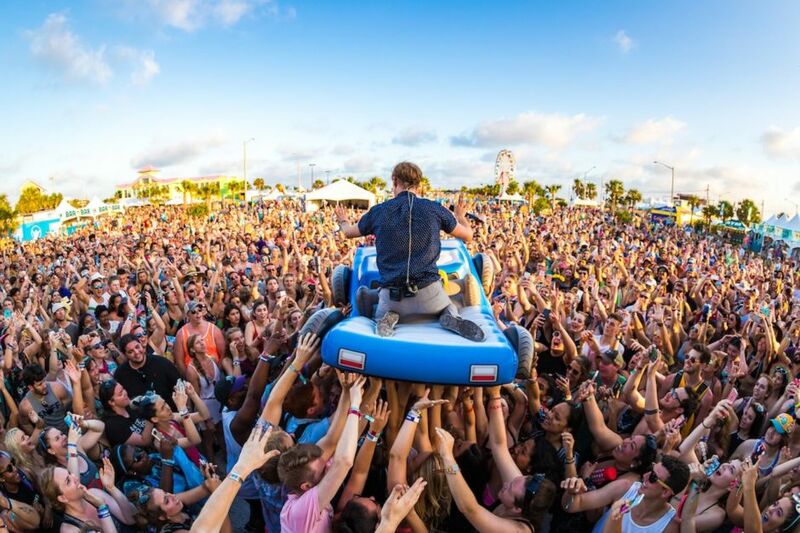 Hangout Fest has featured some pretty impressive lineups in the past, including acts like The Weeknd, Lenny Kravitz, Foo Fighters, Zac Brown Band, and Kings of Leon. If surfing the crowd isn’t your jam, don’t miss the photo-worthy “Hammock Beach” set up as part of the event, too — thanks to the Ferris wheel and the actual wedding chapel, you can’t miss it. And with its white sand and giant beach chairs, it’s just as Instagrammable as the stage. Your childhood pirate dreams are about to re-emerge in all their glory. In 2013, the Alabama Gulf Coast Reef and Restoration Foundation intentionally sank The LuLu, a 271-foot retired freighter ship reportedly named after Jimmy Buffett’s sister, Lucy “LuLu” Buffett. The ship is now a full-fledged marine habitat teeming with snapper, octopus, jellyfish, and crab. Several local dive shops, including Down Under Dive Shop, will take you on the approximately 90-minute boat ride out to The LuLu, as well as other nearby wrecks and dive sites. Afterwards, round out the day by heading over to LuLu’s Gulf Shores, Lucy Buffett’s massive restaurant complex. You should expect a decent wait no matter when you go, but the almost comically outrageous number of activities available in the outdoor waiting area — a ropes course, live music, a marina, crafts for kids — mean the wait is almost as good as the Cheeseburger in Paradise and Krispy Kreme Bread Pudding you’ll be having for dinner and dessert. If you don’t squeal with delight every time you catch even the slightest glimpse of a dolphin in the wild, we must have two different definitions of joy. I force everyone I’m with to stop what they’re doing and watch these majestic creatures with me. And at sunset? Oh, man. While seeing dolphins from the shore is great, seeing dolphins from a boat on the open Gulf is downright amazing. There are countless tour operators who can take you on a variety of dolphin cruises, ranging from packed motorboats to private sailing charters to double-decker cruisers. There’s also sunset dinner cruises and options for the family — who’s down for a water fight or touching a live blue crab? You probably didn’t come to the beach to go to the zoo, but the Alabama Gulf Coast Zoo is not an ordinary zoo. You can touch a sloth at this zoo. You can hold a baby kangaroo in your own little cloth pouch at this zoo. You can cuddle a lemur (or a snake, if that’s your thing) at this zoo. You can hug a tamandua, realizing you’re touching a species you didn’t even know existed. Nope — not an ordinary zoo. These animal encounters aren’t included with regular zoo admission, but are kid-friendly, don’t require advance reservation, and range from $5-$10 — an absolute bargain for this kind of exposure to wildlife. One of my favorite things to do here is to rent a kayak or SUP for the day, or even for the week. The variety of paddle-able terrain keeps it spicy — there’s sea kayaking, sure, but so many other options as well. You have the Bon Secour River, Orange Beach’s back bays, Gulf Shores’ Little Lagoon, Cotton Bayou (dolphins! ), Bird Island and Robinson Island, and the Orange Beach Canoe Trail. Paddled By You rents SUPs and single, double, and triple kayaks in two-, four-, and eight-hour increments (and they’ll offer tons of suggestions for paddling spots, should you need them). Keep in mind you can also paddle out to restaurants like Anchor Bar & Grill and Pleasure Island Tiki Bar for when the hunger hits. No trip to Alabama’s Gulf Coast is complete without a picture of you holding your catch on a fishing charter (bait, gear, and the necessary fishing license is always included). Bonus points for wearing appropriately branded angler clothing and sunglasses. Seriously, the fish are massive, delicious, and everywhere in these waters — get out there and hook one! 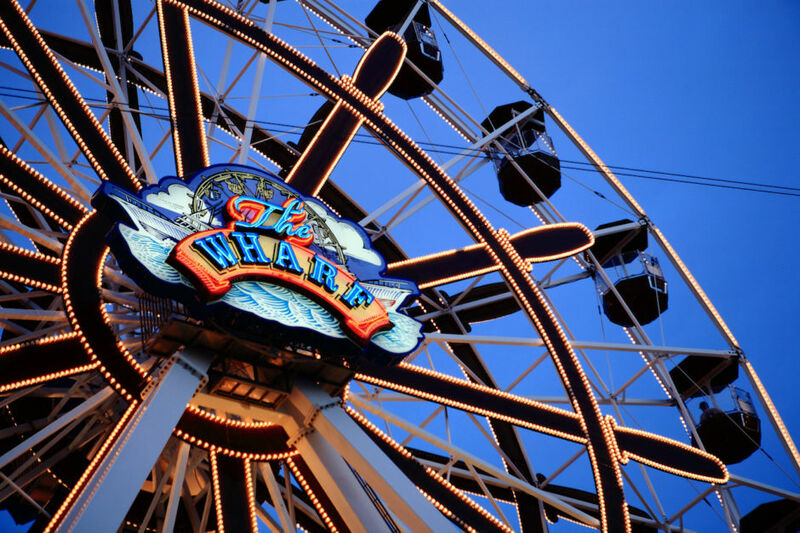 If you missed the beachfront Ferris wheel at Hangout Fest, check out one of the South’s largest Ferris wheels at The Wharf. There’s also a marina, a movie theater, loads of bars and restaurants, and the Red or White Wine & Gourmet Center — which means this is the perfect place for a romantic date night. The Wharf complex also has tons of shopping and other indoor activities, making it a great rainy day option, too. You read that correctly. “Throwed rolls” is the official term at Lambert’s, a sprawling country-style restaurant just north of Gulf Shores that serves gigantic portions, pass-arounds, and literally throws rolls across the restaurant at patrons. If nothing else, you’ll get a few ideas for how to make your family dinners more exciting. Pro tip: Come early, be prepared to wait, bring cash, and if you’re not starving and don’t mind going meatless, try the sides plate and fill up on those giant throwed rolls. You’ll officially be a proud member of our Gulf Coast family afterward. Parasailing is a bit of a rite of passage for any frequent visitor to the Alabama Gulf Coast. It’s a thrill, and one that pretty much anyone can have, young or old (kids can even fly three at a time). And it’s probably more affordable than you’re imagining, running around $60 a person. Online bookings take a second to nab, and most allow observers who aren’t quite brave enough to make the 800-foot flight to ride along in the boat. But don’t make excuses — this is a memory you shouldn’t put off for next time. This post is proudly produced in partnership with Gulf Shores & Orange Beach Tourism.